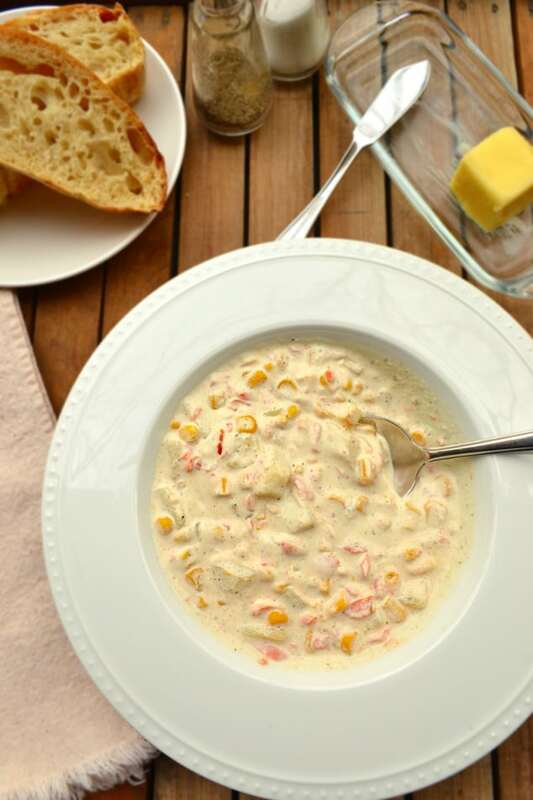 Creamy, rich, delicious Smoked Trout Chowder. Serve it with fresh crusty bread and a glass of your favorite white wine and you’ll have yourself a wonderful dinner. Did you ever fall in absolute love with a restaurant? Did you ever find the perfect balance of delicious food, top notch service and fabulous atmosphere? It happened to us, and oh, it was wonderful. We visited for dinner often, at times too often. We praised the place regularly – we wanted everyone to know the deliciousness and joy we knew. We even had a small get together there following our wedding. It was love. Then like every “too good to be true” love story, it came to an end. The chef left. Then some of the kitchen and wait staff followed. We tried eating at the restaurant numerous times since, but the place has never been reinstated to it’s former glory. While all the food on the menu was impressive, there are a few dishes that I will never get over. This Smoked Trout Chowder is one of them. This soup is not an exact replica of what this restaurant had made. To tell you the truth, it’s been over 2 years since I had a “proper” cup of this chowder – so I couldn’t even start to replicate the version I knew and loved. That being said, this chowder is a delicious reminiscence of what had been. I didn’t have any stock on hand, so I cooked some canned broth down with some veggies to concentrate it with rich flavor. You could skip this step if you had good stock. Any good chicken, vegetable or fish/seafood stock would do. On that same note, feel free to use your choice of smoked fish. 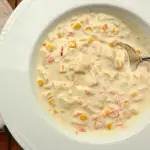 Also, if you prefer a thinner, not as rich, chowder you can decrease the cream a bit and substitute equal amounts of milk or even substitute half & half all together. 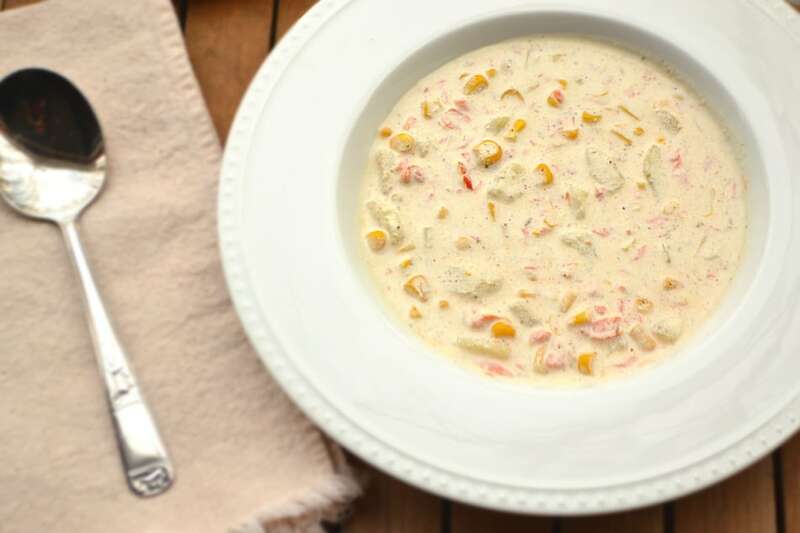 I really love this rich, creamy, delicious Smoked Trout Chowder. It’s not as wonderful as the version that inspired me, but it keeps me & my belly smiling nonetheless. Thanks so much for stopping by! Happy Cooking! 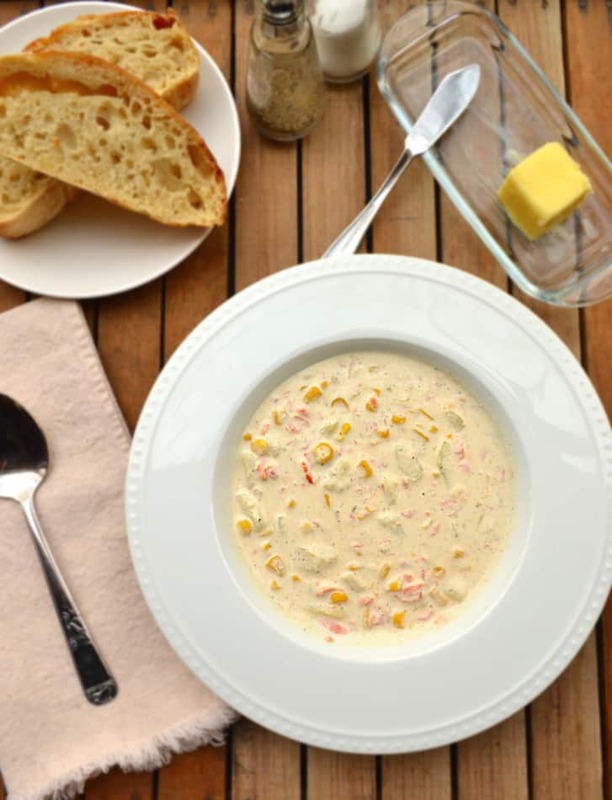 Creamy, Rich, Delicious Smoked Trout Chowder. Made with Cream, White Wine - Use Your Favorite Smoked Fish or Seafood. Gourmet yet simple. Melt butter in a large saucepan/stockpot. Add celery and onion, saute until onion is translucent. Add garlic, saute for a minute or two. Add chicken broth, parsley, salt and pepper and bring to a boil. Reduce heat and simmer covered for about 20 minutes, stirring a few times. Add diced potatoes, cook about 10 minutes or until just tender. Add cream and trout. Gently simmer (do not let it come to a boil) for 15 - 20 minutes, stirring often. Add white wine and corn, cook & stir for another minute or two. Salt and pepper to taste. Sprinkle with paprika before serving. Enjoy. I’ve never had trout before and would love to try it. 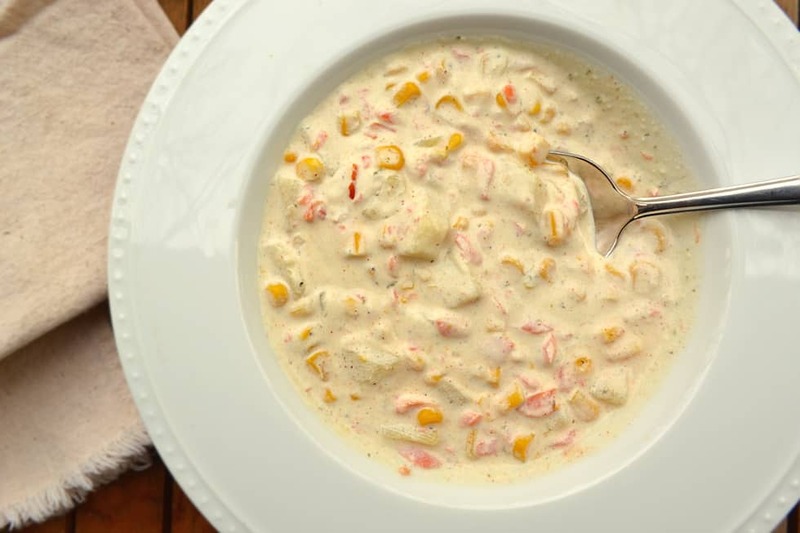 This chowder sounds so good and is perfect for this time of year. We’ve finally got some real snow in Michigan and this chowder would warm me up for sure. Great for cold days that are coming. When my fiance and I first started dating, we used to go to a restaurant called Perkins and I loved that place. Good food, great service, but they up and left. I was sad after that. This a seafood chowder I have never had but it looks and sounds amazing…smoked trout?…sounds so good! I feel your pain when it comes to not being able to have your favorite menu items anymore. It has happened to my husband and me too many times where our favorite menu items are removed and forever out of our grasp. It feels like such a loss. Thanks so much Thao! It’s so disappointing when restaurants remove menu items, change staff or close down. We have since found a few restaurants we enjoy but they’re a bit of a distance away. Boo. Thank you Kushi! Chowders are delicious – definitely a comfort food! This soup looks tasty & creamy. Pinning to the Soup board. Thanks! Where do I find smoked trout? I found it at a nearby seafood market. If trout isn’t available, any good smoked fish you can get would work. Which the ingredients in your recipe is pink. Pink potatoes do not come to pieces so it make sense to use russet which is not pink. You have ;no carrots and no salmon. So what is pink in the ;picture of your plate? The smoked fish is pinkish/orangish in color. Just exactly what I was looking for ! Smoked Salmon Trout Chowder ! I defrosted my fridge today and two packs if smoked salmon trout thawed so need to use it by tomorrow. Will sub petite pois for corn as I am allergic to corn. Thank you Amanda from sunny South Africa ! This chowder IS delicious! Love it!